MOA Vs. MRAD: What’s Best for You? We’d love for a clear winner to emerge, but often, the reality is our subjective personal preferences are really the only sticks we have with which to measure competing options. In many ways, this is the case with scope reticles and turrets measured in minutes-of-angle versus milliradians. In fact, the last grudge match I mentioned above — between metric and imperial units — is apropos here, because MOA versus mil or mrad boils down to just that: a difference in how we format degrees of angular measure. I know this can be confusing, but we’re going to break everything down and try to demystify the topic for those of us who just want to know what we should choose. We’ll look at the differences between MOA and mil measurements, figure out what’s relevant to you as a shooter, and see if we can find any strong or even weak reasons to prefer one over the other. Minute-of-angle is just an angular measurement. It’s based off the number of degrees in a circle — 360 — and the number of minutes in a degree — 60. This is an arbitrary arrangement going all the way back to the Egyptians and Mesopotamians that is used simply to provide a standard of measurement. They divided a circle into 360 degrees, basically because they used a base-60 numerical system (we use a base-10 system). So we do too. 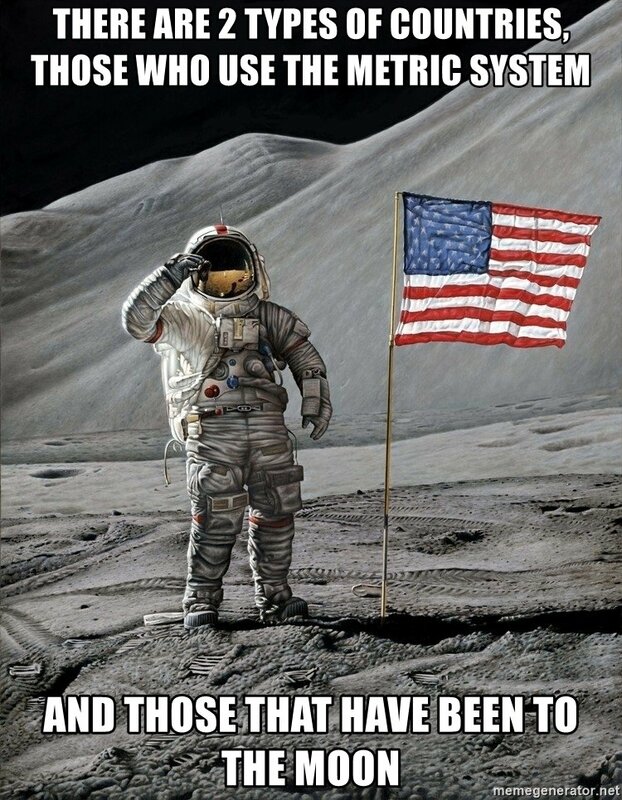 Because history. OK, some of you might be saying … What does that even mean though? Think of it this way. Let’s say you’re looking at a target that’s 100 yards away. Now, imagine there’s nothing around or under you, and a circle appears around you, where you are at the center of the circle, and the outside edge of the circle passes through the direct center of the target. If you divide that imaginary circle into 360 degrees or 360 pie slices, and you walk out and measure the distance between those degrees or slices, that distance would be 62.83 inches. This means that at 100 yards, 1 degree of angle measures 62.83 inches. Does that make sense? Good. Now, if we were to further divide that degree by minutes, we’d get the number 1.047 inches, because there are 60 minutes in a degree. By the way, isn’t it interesting that our measure of one minute-of-angle is very close to 1 inch at 100 yards? That’s partially why, when we’re sighting in a rifle using an MOA-based scope, we often shoot at targets with 1-inch grids on them. At 100 yards, if all of our shots hit within a single square, we can be sure we’re shooting a sub-MOA grouping. Though this is purely coincidental, for our purposes as shooters, it’s extremely convenient, because this relationship between distance and minute-of-angle holds mostly true as we move out by 100-yard intervals. At 200 yards, one MOA equal 2.094 inches. Out to 1,000 yards, 1 MOA equals 10.47 inches. You can find your MOA measurement by multiplying the distance in yards by 1.047, then dividing by 100. And at each increase of 100 yards, you’ll find that you’ve added roughly 1 inch to your MOA measurement. You’re basically just adjusting your measurement to “shooter’s MOA,” which is just your MOA rounded down to the nearest inch measurement. 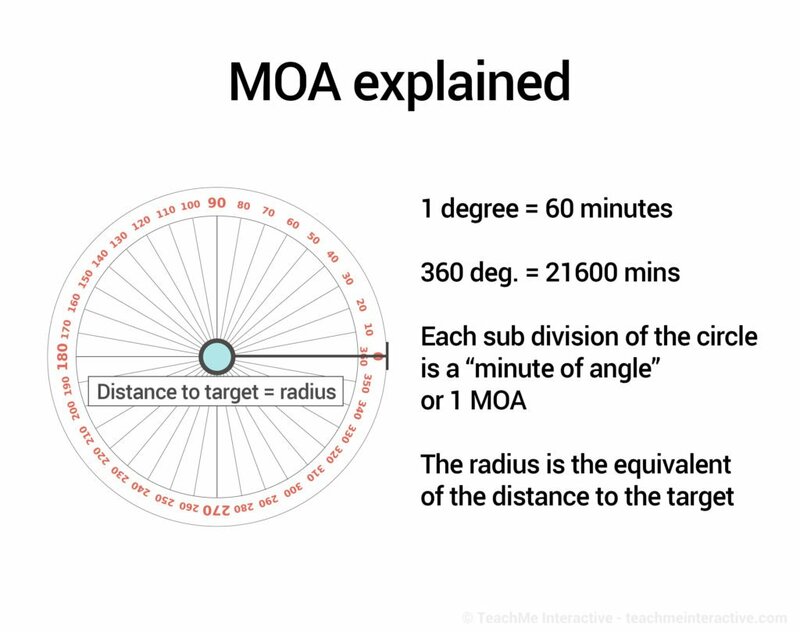 So, like MOA, a mil or mrad is just an angular measurement. The difference is, while there are 21,600 minutes in a circle, there are 6.2832 radians in a circle, and each radian has 1,000 milliradians in it, so there are 6,283.2 milliradians per circle. Incidentally, a milliradian is a measurement derived from the International Standard of Measurements, which is the same system that gave us the metric system. So if you hate the metric system, you might want to stick with MOA. Jokes aside, the only practical difference between MOA and mil is that the unit of measure is different. There’s nothing magical or mysterious going on here. We’re just talking about the same difference between inches and centimeters. At 100 yards, a mil subtends — or measures, for our purposes — 3.6 inches. Just like 1 MOA measures roughly 1 inch at 100 yards. At 200 yards, 1 mil is 7.2 inches. At 1,000 yards, 1 mil is 36 inches. To find your mil, just multiple your distance in yards by 3.6, and divide again by 100. That’s it. It’s that simple. But Wait … Is It That Simple? Let’s get into what the differences amount to. You probably immediately noticed that 21,600 minutes is a lot more than 6,283.2 milliradians. 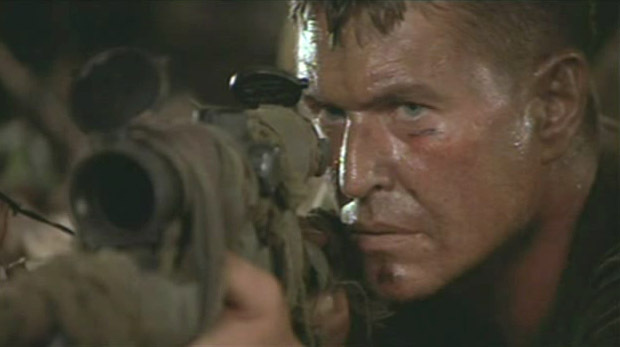 But you also know that scope adjustments are almost never done in one-MOA increments. Instead, MOA scopes are generally adjusted on the ratio of one-quarter MOA per click (some shorter range or CQB scopes are in 1/2 MOA, check your user manual to be sure). That means for any MOA scope, 1 click will equal 0.25 inches at 100 yards (assuming your scope is in 1/4 MOA clicks). 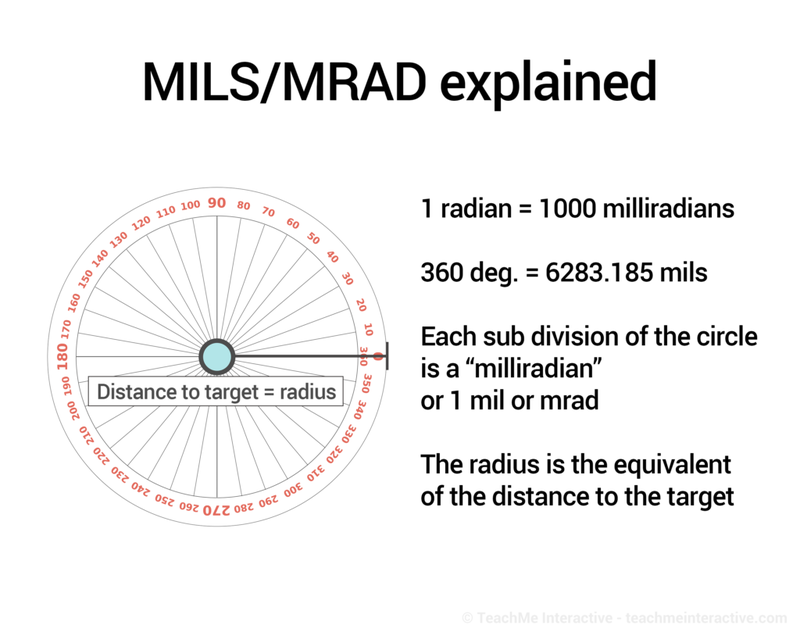 Milliradians are also divided on most mil scopes by tenths. That means that each click on a mil scope is 0.36 inches at 100 yards. A visual aid to understanding the difference at range of what 1/4 MOA and 1/10 MIL is. Note: this is not to perfect scale. In both cases, these finer adjustment intervals give us more precise control of where our reticle is pointing. Also, MOA-based scopes are a little more precise — 0.25 inches versus 0.36 inches at 100 yards. That said, the difference isn’t substantial. At 1,000 yards, for instance, one-quarter MOA subtends to roughly 2.6 inches. At that same distance, one-tenth of a mil subtends to 3.6 inches. There are confounding factors, of course. It’s possible to have a mil-dot reticle and a turret that adjusts using MOA. Also, to further complicate the issue, we need to consider whether the scope you’re using places the reticle on the first or second focal plane. But how to actually make an adjustment at range, or what the difference between a first- and second-focal plane reticle is, are topics for another article. Practical issues aside, there are so many factors to long-range shooting that this relatively miniscule difference in precision isn’t going to make or break your ability to hit your target. So, we’re left with personal preference to make our decision. Let’s go over why we might choose one style over the other for our shooting pleasure. Neither system is inherently superior to the other. In almost all situations, both systems of measurement will serve adequately for your shooting needs. If you grew up hunting using MOA, and you’re familiar with that system, my suggestion is to stick with it if that’s your intended application. This is especially true for me, because I don’t advocate taking shots at game beyond 400 yards, in almost all circumstances. But that ethical question is for you to decide. For the average shooter, I do think the practical relationship between 1 MOA at 100 yards and 10 MOA at 1,000 yards is somewhat easier to understand and use effectively. If, however, you’re getting into long-range shooting as a sport, you’ll have a few more issues to consider, and you’ll very likely want to go with a mil-based scope. It’s safe to say that in tactical situations — and, by extension, sport-based long-range shooting applications — mil scopes have superseded MOA scopes. Basically, because the mil system is popular with the military and law enforcement, the civilian market has adopted it as well. But this isn’t purely an aesthetic decision, in my opinion. Real talk – was Tom using MOA or MIL? There are several reasons mil systems are popular, but it essentially boils down to two facts. Using mil turret adjustments is much simpler when ranging with mil-dot reticles because you don’t have to make an MOA-to-mil conversion, and you will have to make fewer clicks with a mil-based turret to make a correction (because MOA turrets are more precise, and thus require more adjustment clicks for a correction). 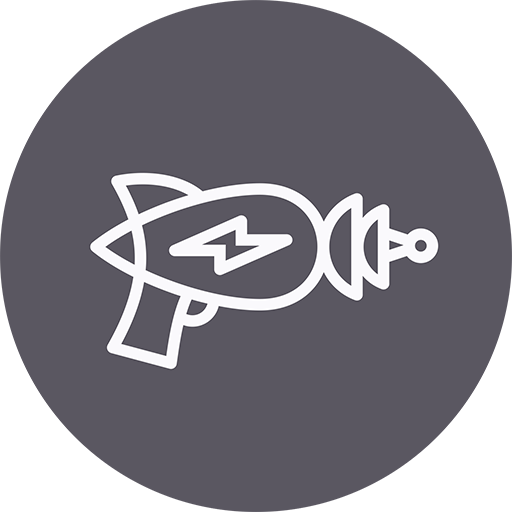 If you’re used to making that MOA-to-mil conversion, however, you might not think making the adjustment is difficult at all. Ultimately, you can train and become proficient with either system. Now, all of this takes practice. When you’re shooting at long-range, you’ll inevitably be doing various mathematical calculations. When it comes to the difference between hitting a target or not, the simplest method is probably best. This is a big part of the reason why the mil system has essentially taken over tactical and long-range shooting applications. At greater distances, many shooters basically just find it easier to use. If that isn’t enough for you to choose mil for sport long-range shooting, consider this: it’s the system most other long-range sport shooters are migrating to, if they haven’t already. It makes sense to be on the same page for the sake of simplicity, in my opinion. And I prefer to use an MOA scope, so I’m not just a mil fanboy. Take my opinion with a grain of salt, and tinker around with each system if you can. Give both a try, or if you’re new to one of them, focus on that for a while. Make your own investigation, and figure out what works best for you. Neither system is cooler than the other. Don’t just pick one or the other because of what the military uses, or because your grandfather refuses to try something new. We’re literally just talking about a standard of measurement, after all, and you can learn to become an excellent shooter with either one. Do you use MOA or MIL? Have you switched from one system to the other? Tell us all about it in the comments! Looking for a badass scope? 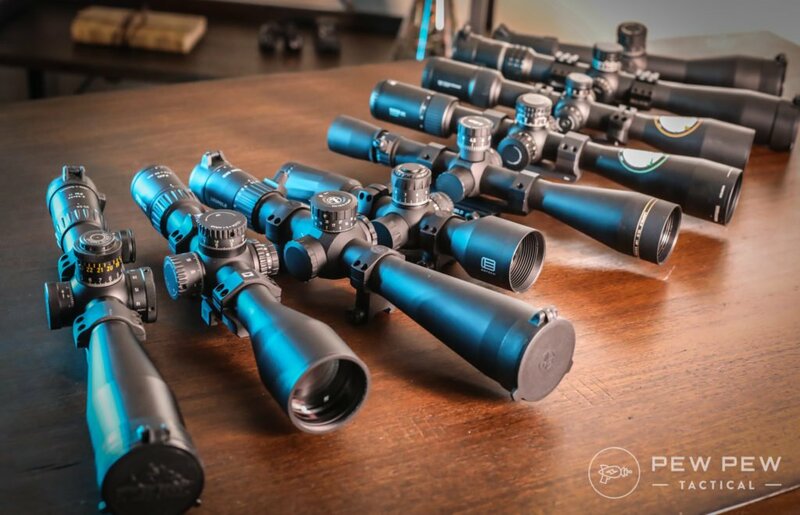 Take a look at the 9 Best Long Range Scopes! I’m an engineer that has designed advanced guidance systems for the Defense dept, and NASA, as well as others. 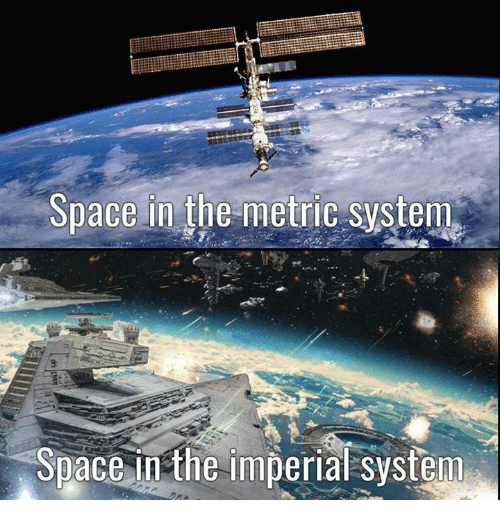 Conversion between the imperial and metric systems has led to some spectacular failures when done incorrectly. I just wanted to compliment you on having done an excellent job of explaining the differences (as it relates to shooting) in a fashion that can be understood by all. I don’t know if this matters much, seeing as most people have range finders. But it’s a backup method… if you can get your moose/elk/mule deer/Taliban commander to stand still long enough. I’m a mil user. It’s easier for my former grunt brain to factor adjustments in tenths. Plus, I learned to use a mil based reticle in the Army, so I know the formula for ranging using mils (the mildot master is also really handy).